Design for precise data transmission application. This cable is manufactured according to the specific requirements of automation control gear manufacture. Ideal for regular flexing applications including use in cable chains due to fine copper wire strands with high performance insulation and sheathing materials construction. Widely accepted around the world as these cable was govern by DESINA with UL and CSA approval. 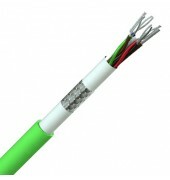 These cables also conform to EU low voltage guide lines 73/23/EWG CETM. Very fine copper wire strands to IEC 60228 Class 6. Polyproplene insulation, coloured core identification. Cores twisted in layers, including screened pairs & fleece taped. Tinned copper wire braid. Fleece wrap. Low friction polyurethane outer sheath. Colour green.